Livery render of the crashed car. Image via Extreme Speed Motorsports. The 24 Hours of Daytona hasn’t even started yet, and there’s already been a crash. Extreme Speed Motorsports had an extreme whoops this afternoon, as Sportscar365 Editor-in-Chief John Dagys reports that their No. 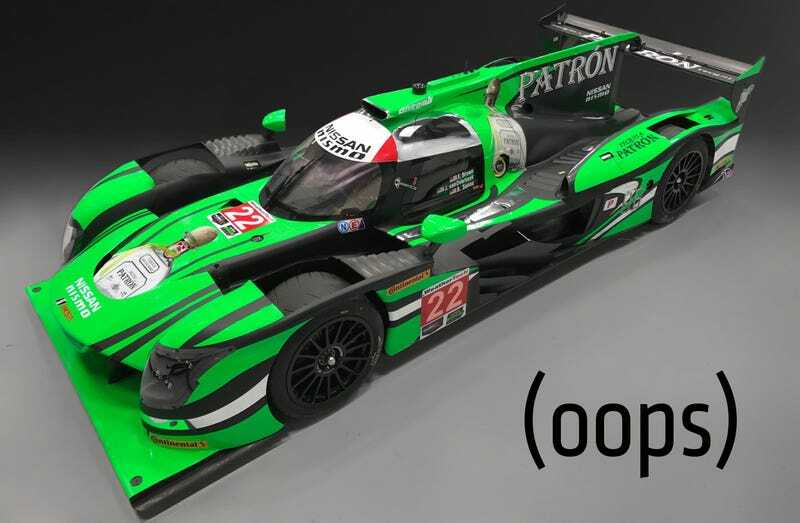 22 Nissan DPi racing prototype had a fender-bender during an on-track photo shoot. Per Dagys’ tweets, ex-Formula One driver and Ayrton’s nephew Bruno Senna was driving when the car sustained radiator and sidepod damage in the incident. No official word has been released as to whether anyone was injured in the mishap. While photo shoots are done at speeds far below race pace, the process of shooting on-track glamour shots is surprisingly intense, and they typically involve a photographer shooting out of a moving vehicle. Dagys also notes that spares for the new Nissan DPi that ESM races are very limited, meaning that they may be eating into items they brought for the race itself to get it ready for this weekend’s grueling 24-hour-long race. This is terrible news for the lone Nissan prototype squad on the grid, and one of the teams we love to watch. ESM took the overall win at both the 24 Hours of Daytona and the 12 Hours of Sebring last year. Additionally, all of the cars competing against it in the WeatherTech Sportscar Championship’s Prototype class are brand new for 2017. Once Humpty Dumpty DPi is put back together again, Senna will share driving duties in the No. 22 car with Ed Brown, Johannes van Overbeek, and full-season Porsche 919 driver Brendon Hartley. Hartley, who is listed as a fourth driver on both ESM team cars, won the World Endurance Championship’s drivers’ title in 2015, and just came from winning the 24 Hours of Dubai. In other words, we want to see this car race. Fix it now, please. UPDATE: The damage looks relatively minor, at least from these pics. Hopefully it won’t take too long to fix. UPDATE #2 [8:00 p.m.]: A team spokesperson confirmed that the “crash” (if you can call it one) was incredibly minor, and that no one was hurt. The car should be ready to race with no issues.